I know, the title’s pretty much hopeless. Oh well, I wouldn’t be Icy Comet if I wasn’t a master at thinking up bad titles. There’s a new power-costume-thing in the Poptropica Store! Right in time for Halloween. So, if you’re in search of that just-right scary costume, maybe this is the one for you. There’s a new Gold Card available in the Poptropica Store! With the Skeleton Power, you can turn yourself, and everyone else, into a bag of bones. Here’s a picture of the card. It costs 75 credits, which is the normal price for a costume. So, what do you think? 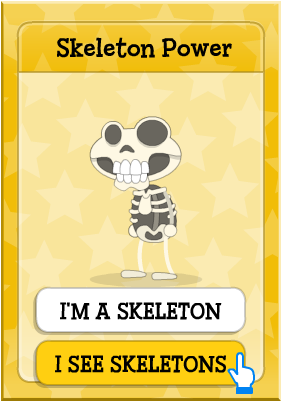 Will you be getting this new gold card for Halloween? This entry was posted in Costumes by Icy Comet. Bookmark the permalink. What? Are you annoyed that you’re a skeleton?